Snippets of Jack: "That is without doubt the worst pirate I have ever seen." "That is without doubt the worst pirate I have ever seen." Out of all the Naval officers Captain Jack Sparrow defeated; Commodore James Norrington is probably the most memorable. After completely failing to first capture and then hang, Captain Jack Sparrow; The Commodore was relieved of his postion and became a drunken pirate. And in the end Commodore Norrington was killed helping his first and only love; Elizabeth Swan. James; "Well, well. Jack Sparrow, isn't it?" 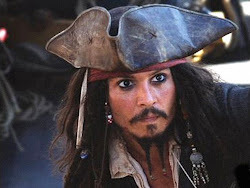 Jack; "Captain Jack Sparrow, if you please, sir. "James; "Well, I don't see your ship, Captain. "Jack "I'm in the market, as it were." Jack: "Gentlemen, m'lady; you will always remember this as the day that you almost caught Captain Jack Sparrow!" James: (deep sigh) "Gentleman to the shore."